You only need one dollar* to journey to the land of Elvis, ribs and soul music. Situated on a bluff overlooking the Mississippi River, Memphis has long been a stage for seminal moments in country, blues, soul and rock & roll. And now that Megabus (megabus.com) offers service from Chicago, you can get there for as little as $1. The nighttime trek clocks in at nearly 10 hours, but it isn’t as much of a slog as you’d think—thanks to nap-inducing seats and a few leg-stretching stops along the way. A short cab ride from the downtown Memphis bus station is the Madison Hotel (79 Madison Ave, 901-333-1200), perhaps the swankiest lodging option in town. The sizable, smartly designed rooms and imported linens don’t come cheap (rates start at $240), but it’s worth the splurge since you’re only spending a couple of bucks to get there. 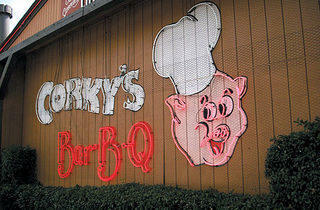 Skip the hotel’s breakfast fare and start your day with some of that famous Memphis barbecue. 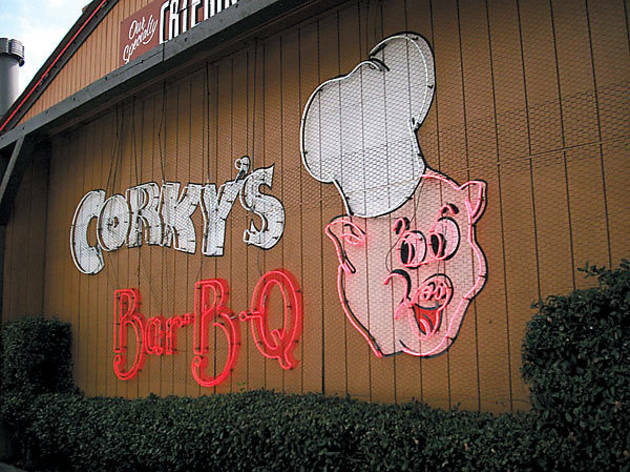 The place to go for the best ribs is as contentious an issue as where to find the best pizza in Chicago, but our cabby, Marcus, a lifelong resident, judges Rendezvous Ribs (52 S 2nd St, 901-523-2746) as the spot for dry rub, and Corky’s (pictured, 5259 Poplar Ave, 901-685-9744) for wet ribs, which are smothered in barbecue sauce. Hop on the south-bound Main Street trolley ($1 for a single ride) for a gut-busting meal at the Arcade (540 S Main St, 901-526-5757). Besides earning acclaim for its basic eggs-and-bacon breakfasts, the Arcade is a popular location for film shoots, including The Client, Great Balls of Fire and Mystery Train. Sandwich names correspond to movies filmed at the restaurant (the tasty roasted eggplant, red pepper, feta and pesto ’wich is tagged “21 Grams”). Speaking of sandwiches, you can get Elvis’s favorite (grilled peanut butter and banana) during the requisite excursion to Graceland (3734 Elvis Presley Blvd, 901-332-3322), the King’s palatial mansion that hasn’t been altered since the ’70s (pictured). Choose the mid-priced audio-guided platinum tour ($32) that details accessible areas of the home and grants entry to the King’s rhinestone jumpsuit collection and his private planes. Gift shops hawk an array of memorabilia, from replicas of pill-popping–era Elvis stage costumes to smaller goods like sunglasses. You can trace the roots of soul music from gospel to Al Green and beyond through the artifacts at the Stax Museum of American Soul Music (926 E McLemore Ave, 901-946-2535) in south Memphis or take in the riverside Smithsonian-associated Rock ’n’ Soul Museum, (191 Beale St, 901-205-2533), but rampant Elvisophiles can get another fix during a docent-lead tour of Sun Studio (706 Union Ave, 901-521-0664), where Presley first recorded in the 1950s alongside the likes of Johnny Cash and Carl Perkins. If Elvis fatigue sets in and you’re ready for weightier subject matter, tour Lorraine Motel, the location of the assassination of the Rev. Martin Luther King Jr., and the attached National Civil Rights Museum (450 Mulberry St, 901-521-9699). For a taste of Wicker Park away from home, cab it to Midtown Memphis’s aptly named Cooper-Young district, an area frequented by twentysomething artist-types. Record label and store Goner Records (2152 Young Ave, 901-722-0095) is a one-stop shop for bands in the thriving Memphis punk scene while the crates at Last Chance Records (2072 Walker Ave, 901-272-7922) will trigger any vinyl buff’s Pavlovian drool response. After stopping at Flashback (2304 Central Ave, 901-272-2304), a vintage department store focusing on ’60s-era duds, you should have an outfit just quirky enough to match the decor of dinner-destination The Beauty Shop (966 S Cooper St, 901-272-7111). Serving seasonal contemporary cuisine, the restaurant is housed in an old salon that used to serve the likes of Priscilla Presley. The shampoo sinks now hold beer and ice. The hip clientele dine while sitting on vintage drying chairs. Grab after-dinner drinks across the street at Dish (948 S Cooper St, 901-276-0002), a slick Mediterranean tapas place that transforms into a club later in the evening. The gay-friendly scene is a meat market of grad students from the nearby University of Memphis sipping pricey cocktails and smoking cigarettes on the club’s beds—yes, they have beds and yes, you can smoke indoors. Skip the Beale Street scene (which feels just like our Clark and Division strip) for cheap suds at Ernestine and Hazel’s (531 S Main St, 901-523-9754). Originally a dry-goods store with a brothel above it, the upstairs boasts rooms dotted with mismatched furniture and a pinball machine. While you’re there, visit Nasty Nate, the bartender who’ll wax nostalgic about old-school Memphis for as long as you can stay on your barstool. Unlike Mick Jagger, we didn’t meet a gin-soaked barroom queen in Memphis. But if you wanted to, Ernestine and Hazel’s is the place one might try to take you upstairs for a ride. For more information, visit memphistravel.com. *Fares on the Megabus start at $1 each way and go up to about $30 each way.